Binary options trading requires a skill of being able to look into the movement of a price value in terms of level, direction and momentum. These factors can be backed by sentiments in the market, and recognizing pattern and trends can be formed from considering these sentiments. Before a binary options trader makes a purchase on either a call or a put, he should first know how the price moved historically in order to formulate a strategy based on the trend. This is called Price Action. Price action, in its simplest terms, is an asset’s price. Every asset has a price value that moves with time. These price values generate financial data that are archived into the asset’s price history. The data is processed and displayed in a way that binary options traders can visualize and make something out of the data. This is the information we see displayed on price charts of different binary options brokers. We refer to the way in which price charts change over time as the Price Action of an asset. Studying price action lets a binary options trader see into the moves that other market participants are making over a period of time. This price action, which is reflected in the price charts, essentially depicts the historical market sentiment and condition where patterns such as spreads and spikes can be analyzed. Fundamental analysis should correlate to the changes of the price of an asset. For example, economic news announcements that may significantly change price values should show the corresponding price action in the chart. Price action strategies that are used to trade binary options allow us to be able to understand market sentiment. We do this by “reading” an asset’s price action. To become a price action binary options trader, you must be able to do two things. Firstly, you should be able to effectively read candlesticks, and secondly, you should be able to determine whether a trend is bullish, bearish or indecisive. We have devoted an entire article on candlesticks, but for the sake of discussion, let us recall what a candlestick represents. The colored (red or green) portion of a candle is termed the body. The body of a candlestick represents the difference between the opening and closing prices of an asset for a given time period. If the closing price of the candle is lower than its opening price, the candle body is colored red. 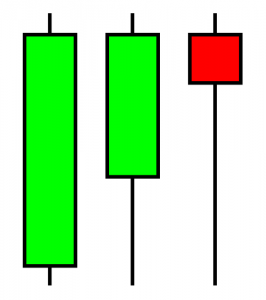 If the trade closes higher than the opening price, then the candle body is colored green. The black lines above and below the candles are called shadows. These represent the highest and lowest points that the price reached during the given time period. 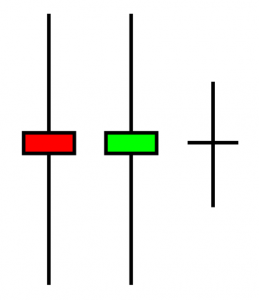 Price action binary options traders would find it impossible to read price action without the use of candlesticks. A regular line chart plots only the closing prices of one time period to the next. 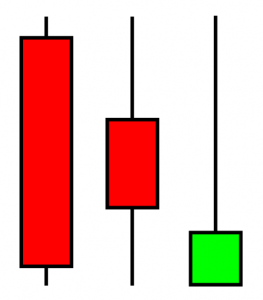 By using a candlestick chart, opening and closing prices as well as the highest and lowest price of a certain time period can be read. That’s four times the amount of information per chart compared to a regular line trend. With more information, binary options traders can study “how” price has moved over a time period as compared to just seeing “where” the price closes. After learning candles and the type of patterns that the binary options trader needs to look out for, the next step would be to analyze price action by studying how an asset’s price moves over time. From this analysis the trader can begin to determine whether the price is moving in an uptrend, a downtrend, or a neither. An asset is said to be in an uptrend if it is making higher highs (HH) and higher lows (HL). If an asset’s price is making lower lows (LL) and lower highs (LH) then it is said to be in a downtrend. If neither an uptrend or downtrend exists (the price is not making HH and HL or LL and LH) then the asset is said to be consolidating. These price action signals provide a way for us to make sense of price movements. By combining price action signals, a binary options trader can formulate price action strategies. These price action strategies will then allow the trader to reliably predict future price movements, giving him an edge over the market and ultimately, profitability. Check out our list of top binary options brokers, and sign up today to test out your strategies. Our site is also filled with resources to help you start trading binary options.